One of the biggest boats on wheels is named Christina. When living in a city anywhere that spans three to seven square miles (as Black Rock City is depending on whom you talk to), walking alone is not going to get it done. Most citizens wisely bring a bike as the main means of transportation, but for others there are a plethora of art cars to hop on to be whisked across the playa. This year, for one reason or another, there seems to be a large influx of boat art cars, reminiscent of the Floating World theme from 2002. My favorite nautical art car of the year, and by far the largest, is Christina. 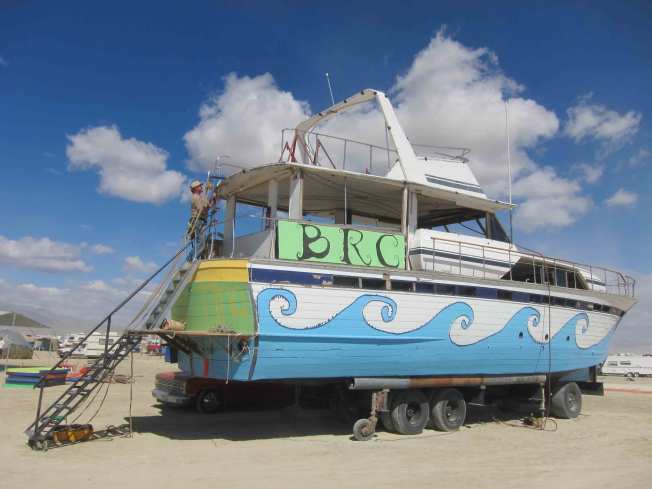 She is a 30,000 pound yacht from Lake Tahoe that has been cut into three sections. Christina was loaded onto two semi trucks and shipped out to the desert where it floats above the playa on top of a Peterbuilt cement mixer. “She’s probably the biggest, most Mad Max art car out here,” claimed owner Jake Jacobson. I think the D.P.W. (Department of Public Works, aka, “We build this city”), might differ in opinion on that one, but that doesn’t hide the fact that anyone watching a 30,000 pound yacht cruise across the playa has to take stop and take a second look to not only make sure what they are seeing is real, but also to make sure they don’t get run over.